Clear Triangular vacuum heads for fiberglass and vinyl lined pools. 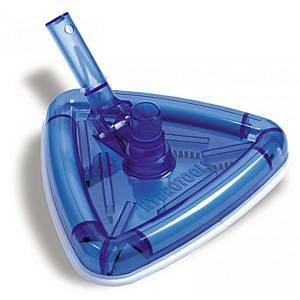 Get the vacuum head that is designed to clean fiberglass and vinyl-lined pools. Its unique triangular shape easily cleans corners, while its cleverly designed angled brushes pick up debris fast and effectively. Accepts 1-1/4" or 1-1/2" vac hose. Snap-Adapt® handle fits on any standard telepole. Weighs 4 lbs. Should be used in conjunction with a telepole (not included).